Messages on the Sidewalk: Don't Call Me Alien; I'm Not Illegal Either. Don't Call Me Alien; I'm Not Illegal Either. 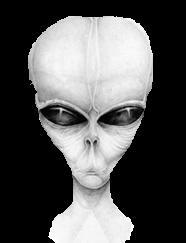 In popular culture an alien is someone or something from outer space. The image that usually comes to mind is some being with huge head, bulbous eyes, elongated body, and a few fingers. They are seen as scary and different from us. The concept, when applied to immigrants in the United States, is not too dissimilar. Essentially, they are viewed with "suspicion" and as "strange" and "unwanted". For the most part, immigrants, whether undocumented or documented, come to this country to make their lives better. They are (again for the most part) hard working "human beings" who are prepared to do the most menial of tasks if necessary in order to make a living for themselves and their families. They are not aliens. They belong to the race of humans. They are not illegal either (or legal). Again, they are humans. Illegality refers to status or practice. Humanity or person-hood or being is not a status. In that regard it is a poor use of language to refer to someone as an illegal alien (a being) or an illegal immigrant (a person) as if illegality resides or is inherent in that individual or is that person's essence. However, it is quite appropriate to refer to that person's residency, status, or presence as illegal, such as, "She is here illegally." but never "She is illegal." Such use of language is preposterous. So let's drop the use of the term "illegal alien" as it is both demeaning and, in terms of language use, ridiculous. Undocumented immigrants is a far more appropriate and accurate term.